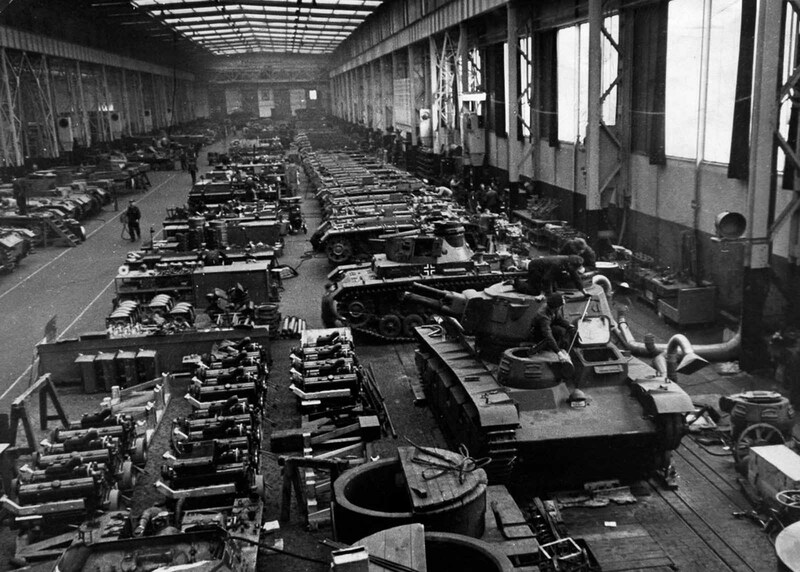 A German tank factory. 1940. The story of the tank began in World War I, when armoured all-terrain fighting vehicles were first deployed as a response to the problems of trench warfare. In Britain, tanks were first referred to as landships. The Landships Committee was set up in 1915 by Winston Churchill to develop designs. To conceal their true purpose from possible spies, they were called tanks, to give the impression of simple water tanks. The name stuck. The first offensive using tanks took place on 15 September 1916, during the Battle of the Somme. . The French and British armies built thousands of tanks, but the German army was unconvinced of their potential and built only 20. The doctrine of armored warfare changed radically in the inter-war years as armies sought ways to avoid the deadlock imposed by modern firepower and looked for the means to restore offensive power on the battlefield. Initially, tanks had been used for close support of infantry, but as modern mechanized doctrine was developed by several armies, tanks became an essential part of the combined-arms team. In addition to infantry support, tanks fulfilled traditional cavalry roles, provided mobile artillery support, and were adapted to combat engineering roles. Tank design gradually improved in the inter-war period also. Reflecting the growth of the automotive industry, tank engines, transmissions, and track systems were improved. By the beginning of the war in September 1939, tanks were available that could travel hundreds of miles on their tracks with a limited number of breakdowns. The tanks deployed by Germany during WWII were inferior in terms of armaments and armor, but had one key advantage: they all carried radios, enabling better tactical coordination and flexible use as rapid attack forces. Nazi Germany was doomed to lose the war against the combined economical might of the Soviet Union and the United States, who both focused on mass-producing simpler constructions. Until the very end, Germans manufactured tanks which were more complicated to produce and service, and only in the last few of years of the war they began to seriously contemplate standardizing their tanks with the so-called E-series (Entwicklung) tanks. The Allied strategy of using massive numbers of medium quality tanks proved effective against the German army. As Stalin used to say, “Quantity has a quality all its own”. 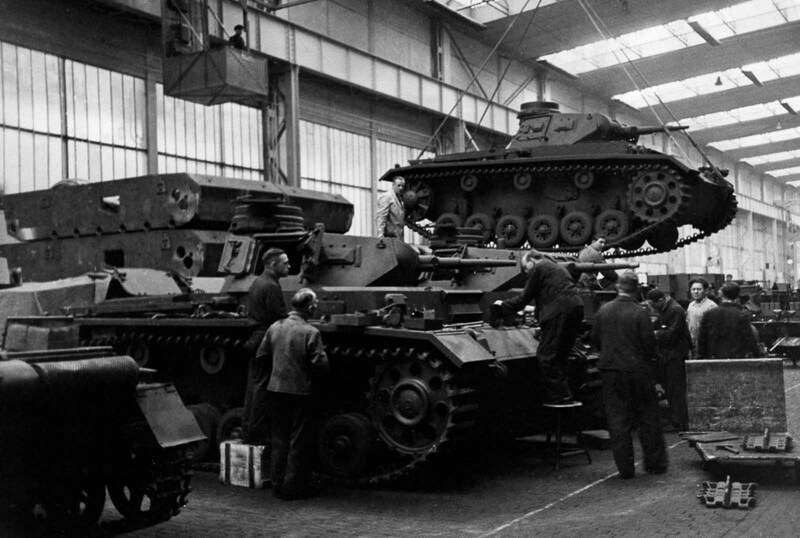 After WWII ended, most tank factories returned to manufacturing their original products. 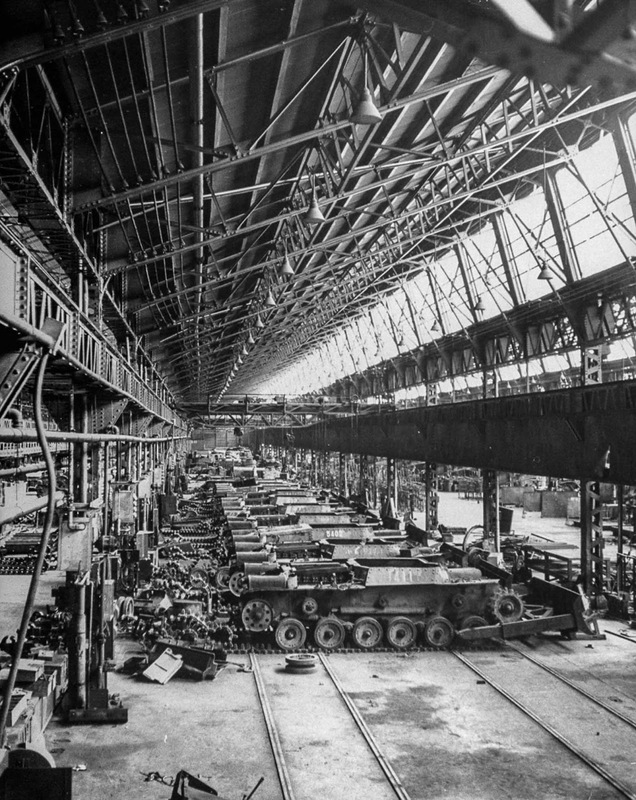 A German tank factory. May 15, 1940. 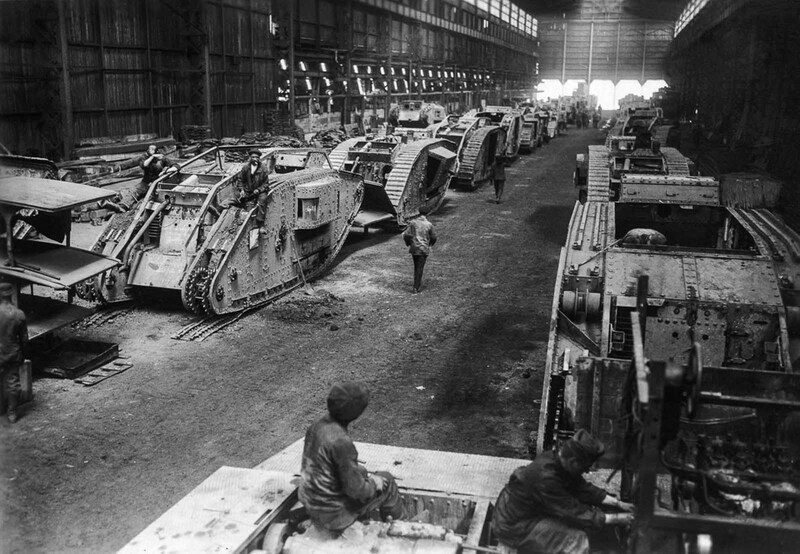 British tanks on an assembly line. 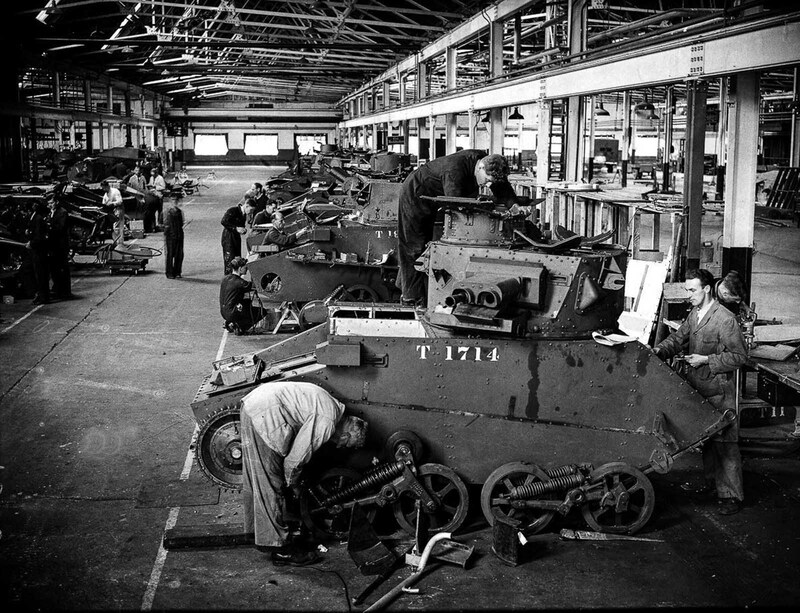 Some of the tanks are being repaired following the evacuation of Dunkirk. 1940. 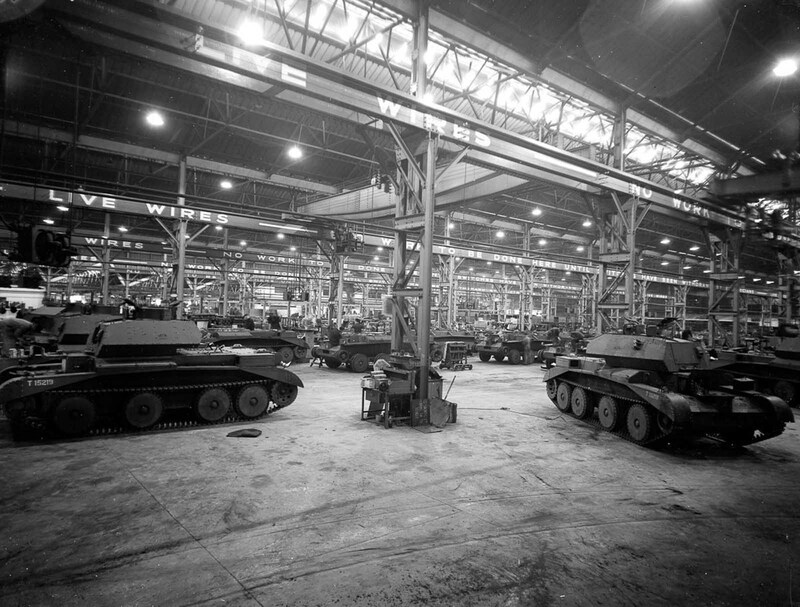 A Ministry of Supply tank factory in Britain. 1940. 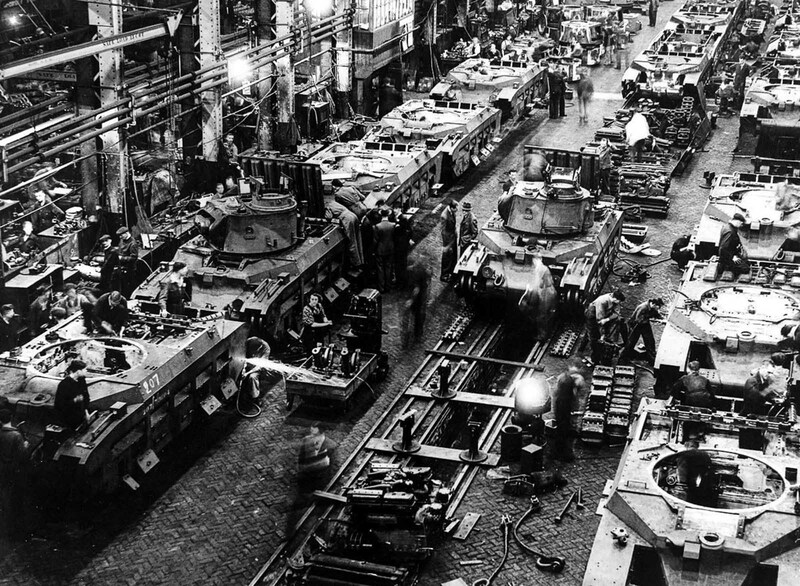 A tank assembly line is a flurry of activity during the “great speed up” of mass production in preparation for the invasion of Europe. 1941. 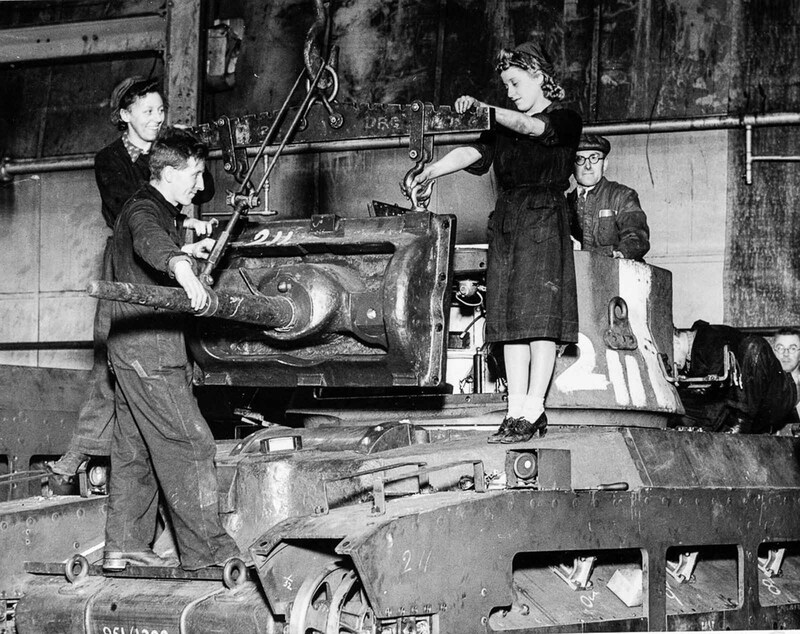 Workers in a Ministry of Supply factory making a turret for a “Matilda” tank. 1941. 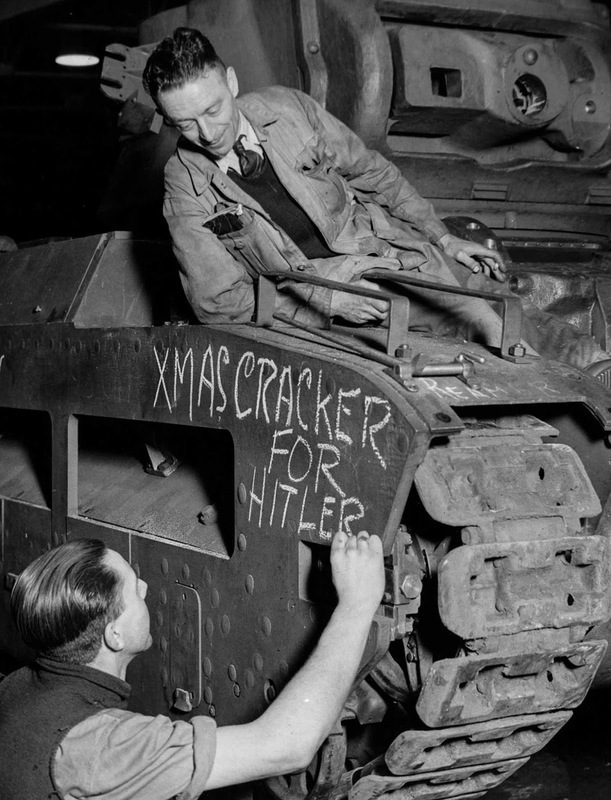 British factory workers leave a message for their adversary. 1941. 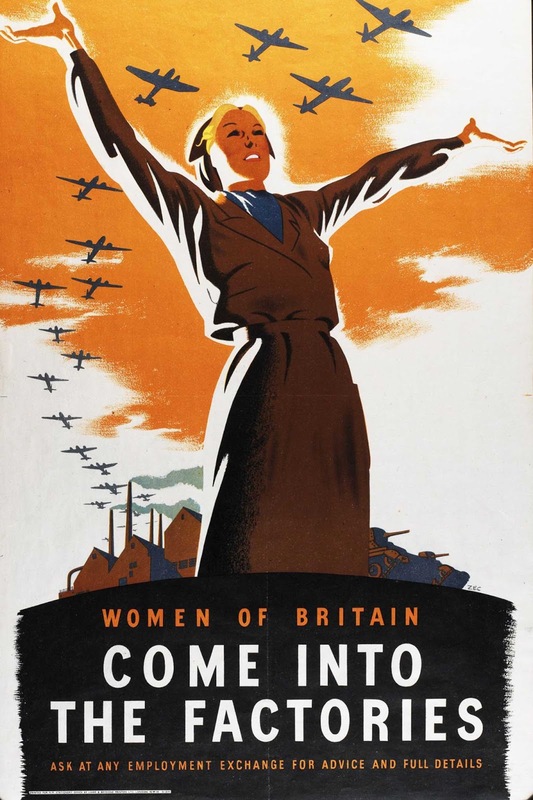 A British propaganda poster urges women to take up manufacturing jobs to help the war effort. 1941. 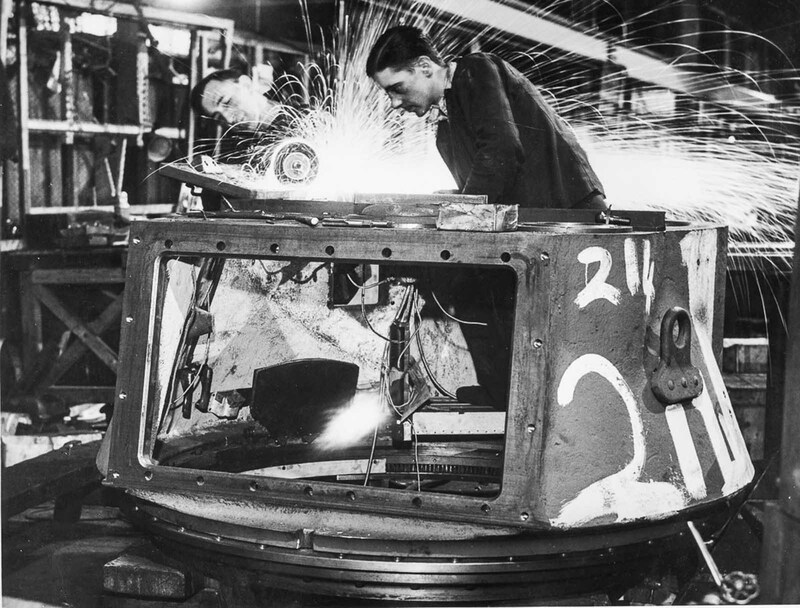 Factory workers in a Ministry of Supply factory fit a gun mounting on a “Matilda” tank. 1941. 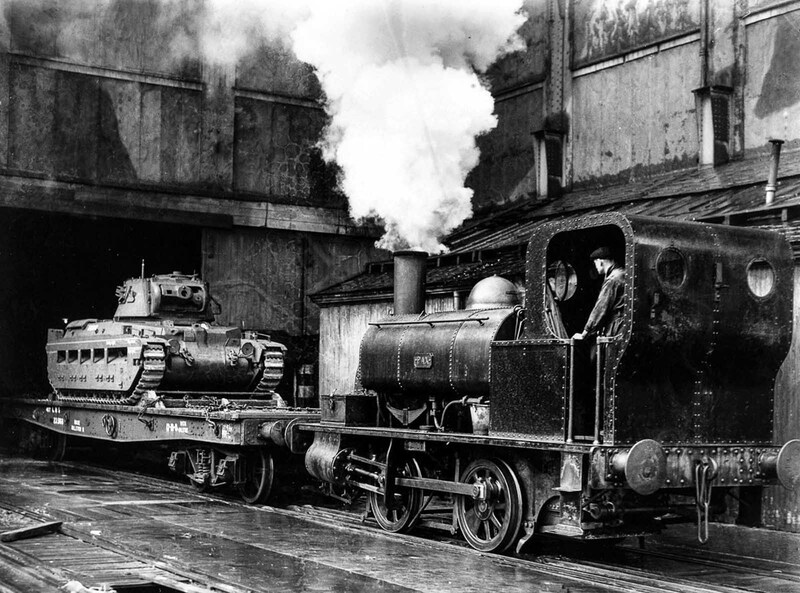 A British tank is pulled by a train from a Midlands factory bound for the Eastern Front to aid the Soviet Union. 1941. 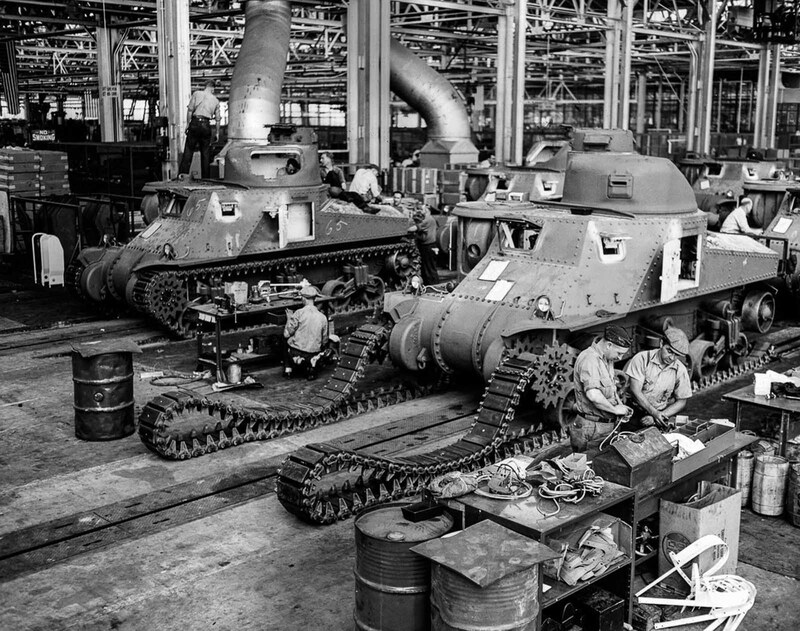 Workers assemble M-3 tanks in an American factory. 1942. 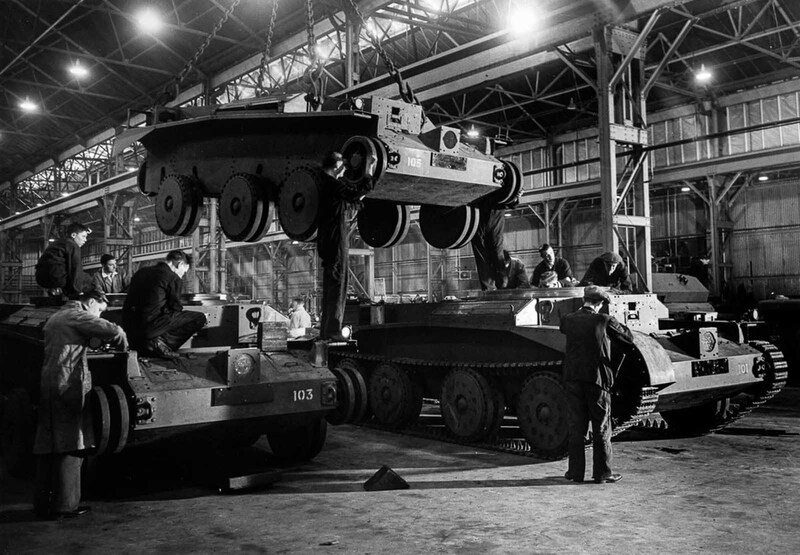 Workers assemble “Cruiser” tanks in a British factory. 1942. 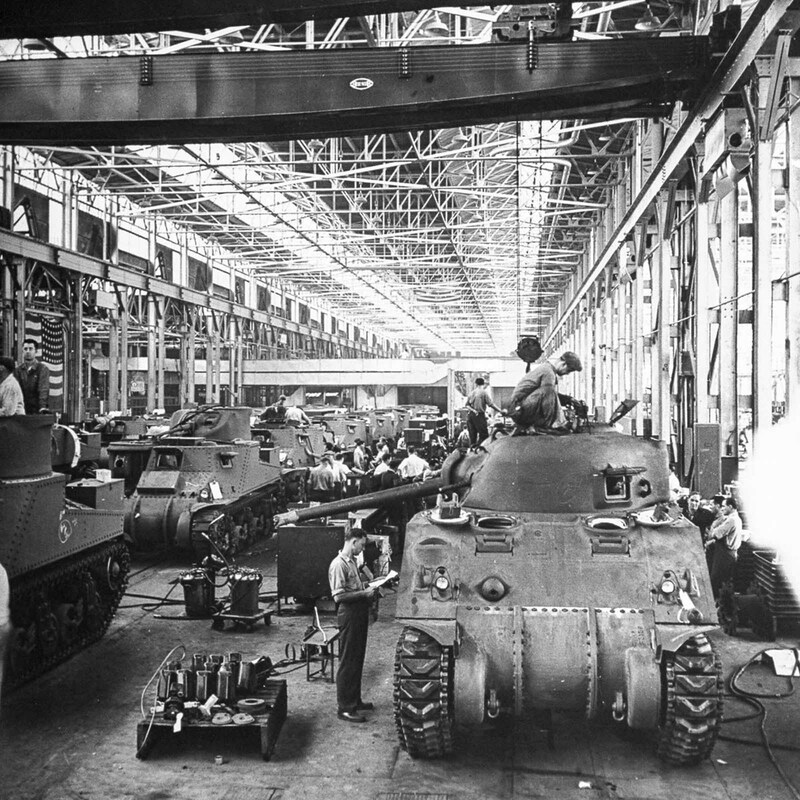 The assembly line at the Chrysler tank arsenal in Michigan changes over from M3 to M4 models while the line continues moving. 1942. 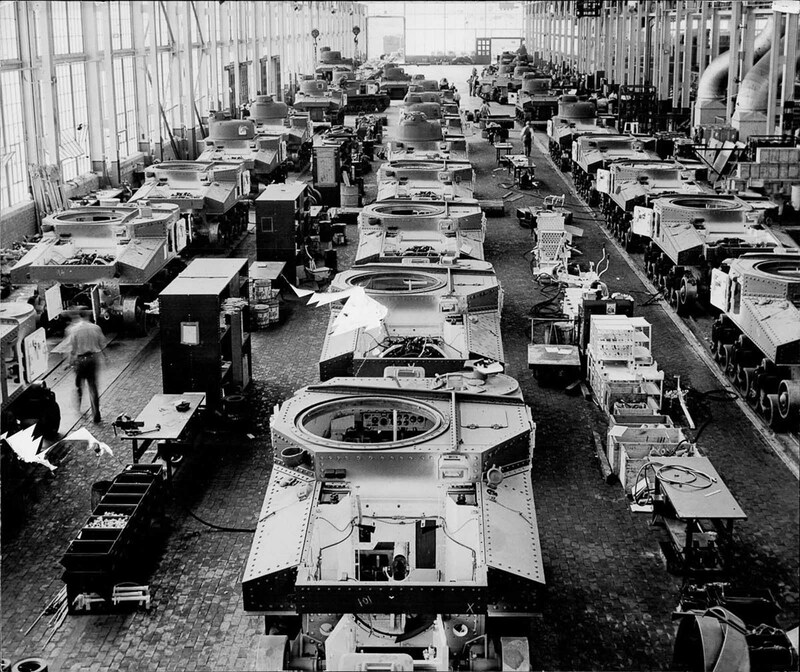 A Chrysler automobile assembly plant in Detroit, reconfigured to produce tanks. 1942. A Mitsubichi factory devoted to building medium tanks sits in disuse after the end of World War II. 1946. 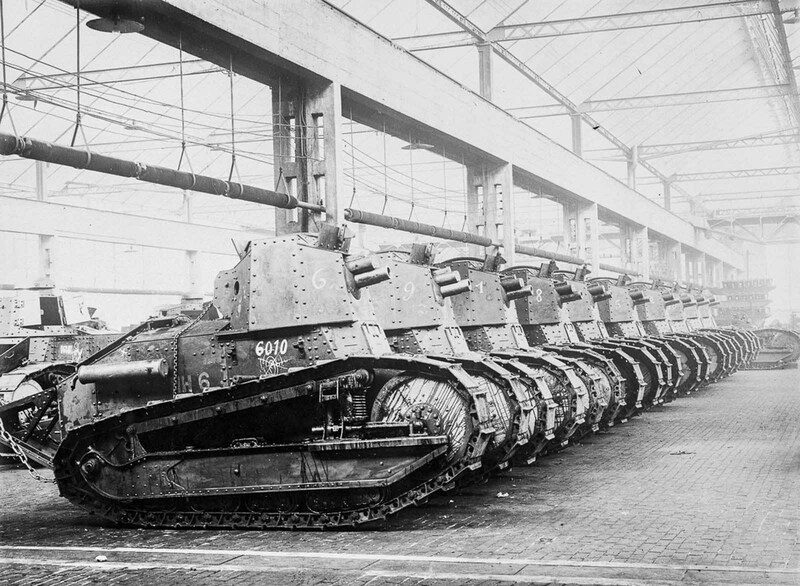 Early Renault tanks built for combat in World War I in a factory in France. 1916. A WW1 factory for the repair of German tanks. 1916. Amazing set of photos. One small quibble, while the German tanks were generally less reliable than their Allied opponents, the German guns were first rate. I'm not sure the 88 was truly surpassed until the age of modern 120mm smooth bores. After closer review, in the last photo, unless those are captured British tanks, the photo is more likely from Britain.